When Ukuleles and Charity Combine. Buy this t-shirt in the colour and style of your choice!. If you don't play the ukulele then you clearly should, and probably know other people who do. In this case then both you and they, and everyone you know, should read on. 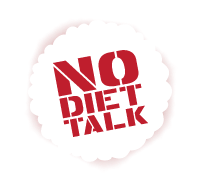 From 17th June until the 31st July 2009, every sale of this t-shirt will result in a £2 donation to Cancer Research UK. This is to celebrate the London Uke Festival which takes place on June 20th in London. So remember, every time anyone buys a Ukulele Hero t-shirt between now and the end of July, £2 will be donated to Cancer Research UK. Racism Against Your Own Children? I know, I know, going on the Daily Mail website is never a good idea. But for some reason I did. I was (duly) horrified by this story, about a white couple who had IVF and due to a mix-up had mixed race children, one of whom apparently has noticeably darker skin than the rest of them. Now, clearly this isn't ideal, it is concerning that such mix-ups can occur, and the couple, who wanted to keep their IVF a secret for some reason, are feeling now that this secret might be revealed. This must be hard for them to hear, but there is a clear reason why he is not happy in his own skin. the Williamses are suing the Belfast Health and Social Care Trust (formerly the Royal Group of Hospitals Trust) for damages for their mental distress, social discredit and breach of contract under the Supply of Goods and Services Act 1982. They consider that their black son is a 'social discredit' to them, his skin colour causes them mental distress, and I'm not sure whether he'd have been consider goods or services when he was 'supplied'. 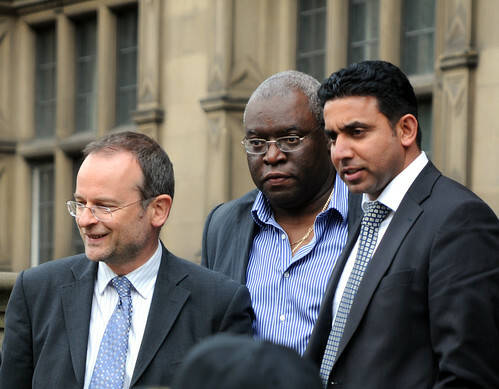 'I felt very angry and betrayed,' he says. 'We'd placed all our trust in the hospital and one person's mistake had ruined all our futures. 'It's not so bad when we all go away on holiday, but at home I've given up picking up my son from school and we don't go out as a family any more. How can this boy have a chance of having any kind of positive self-image, or appreciation of his heritage, with his parents openly suing the hospital, refusing to pick him up from school or take him out anywhere, all because of the colour of his skin? It's no wonder he wants to whiten his skin. 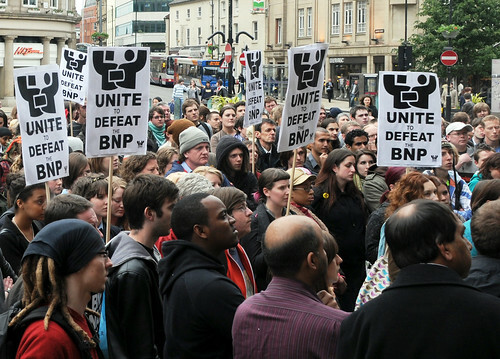 Sheffield Anti-BNP Demo. 8th June 2009. 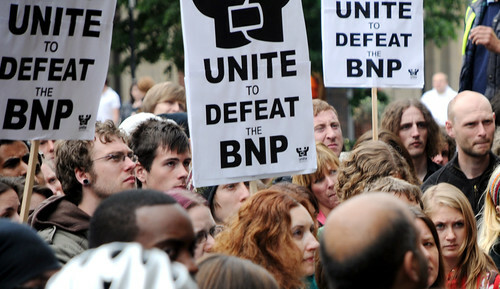 An urgent demonstration was called yesterday in response to the election of two British National Party MEPs, one in the Yorkshire and Humber region. 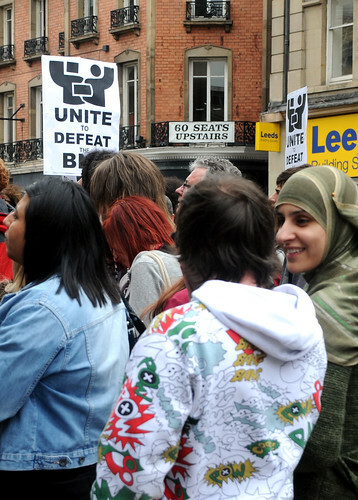 Many gathered outside Sheffield Town Hall to hear speakers, watch drummers and express their disgust and discontent at racists gaining power. It was a heartening event with a good turnout and a positive atmosphere. You can see all the photos of the event here and the best of the photos here. There is also an Indymedia article up too. 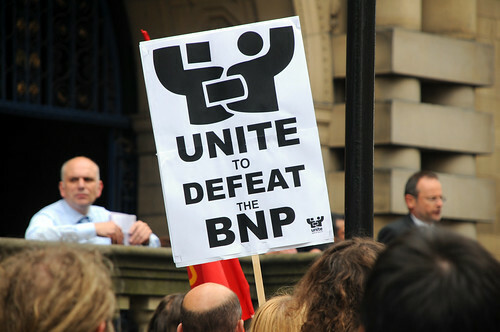 Vote tomorrow, for anyone BUT the BNP.